Welcome to SCUBA News and thanks for subscribing. Today we're delighted to review the excellent Reef Fishes of Oman by Richard Field. 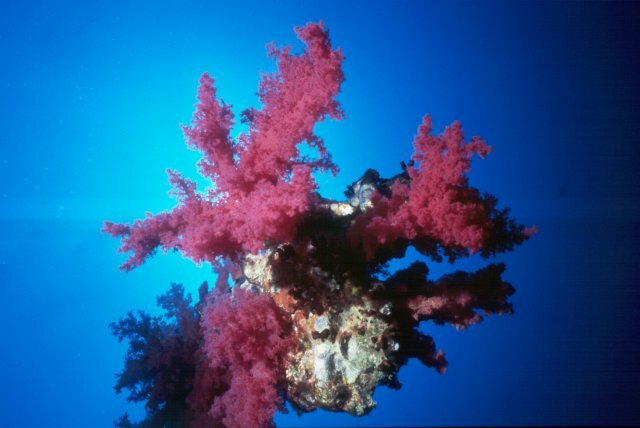 A soft coral is our "Creature of the Month": our article features some lovely photos by Tim Nicholson. Downbelow Marine and Wildlife Adventures! They are the dive company with the most 5 star ratings and reviews in the entire SCUBA Travel site, and we have thousands listed. Based in Borneo, not only do our readers love them but they are also very committed to marine conservation.If you are out that way give them a try. Which are the best dives in the Sea of Cortez? 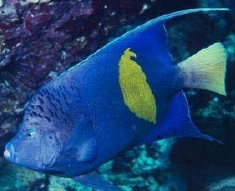 We think the Sand Falls, Cabo Pulmo Rocky Reef and El Bajo: all world class dive sites. Read about these and others at our expanded Baja section. For regular announcements of what's new at the SCUBA Travel site see our Twitter feed, Google+ or Facebook pages. My husband and I are going on holiday to Ibiza second week of October. Can anyone recommend good diving spots and dive charters around that area? by Richard Field, 2013, e-book. For marine-life lovers, the diving in Oman sounds irresistible, with huge schools of fish and as many as 1500 different species. This photographic identification guide doesn't attempt to cover all 1500, but features 385 of those you are most likely to see. The book starts with a description of the three seas bordering Oman: the Arabian Gulf to the North (known as the Persian Gulf in many countries), the Gulf of Oman to the East and the Arabian Sea to the south. I would have liked a map to be included to more easily visualise the area. The useful introduction tells you where you can see the highest diversity of fish, and recommends various diving areas. Some technical details follow on the naming and biology of fish. Then comes the meat of the book - the photos and descriptions of the fishes. Thoughtfully written, the guide is very good at pointing out subtle differences between species which at first glance appear identical. It also adds habitat information. Where a juvenile fish looks different to the adult, the author includes a photo of the fish in its early and late stages. He takes great pains to get the juvenile shot, going so far as to rear an unidentified young fish in his aquarium so that he can observe its development, until it reaches a recognisable adult stage. When a fish is similar to its Red Sea counterpart, this is made clear. The Two-tone Chromis of Oman (Chromis fieldi), for example, is a different species to the Twotone Chromis of the Red Sea (C. dimidiata), but extremely similar in appearance. Indeed, the Omani species was only scientifically recognised this year (by Randall and diBattista). Was the fish named after the author, Richard Field? The book is arranged, like others of the genre, into families of fishes: stingrays, moray eels (lots of them), groupers etc. I especially liked the sometimes quirky descriptions - the splodge of the Yellowbar angelfish resembles "a country map" and a parrotfish is "buck toothed". I also love the fact that the author has included a species of Torpedo ray for which he has no name. Indeed he states that it might be as yet undescribed. And this isn't the only one, there is also an as yet scientifically un-named stingray and moray eel pictured and commented upon. The author not only provides unambiguous identification notes, but also very interesting comments on behaviour and lifestyle. The Rockmover Wrasse "searches for prey, usually in pairs, on sandy substrates, by pushing over rubble and debris to reveal the crabs and molluscs that they feed on. They are usually accompanied by opportunist goatfish. The young appear to imitate floating algae." Some photos look a little murky, due apparently to the waters of southern Oman being very "green", but they are clear enough for identification purposes. The majority of the photos are of the fish in their natural habitat, giving an accurate representation of what you might see. Where reference books are concerned, I have always preferred a hard copy to a digitised version. This one, though, has removed many of my predjuces. You can download the pdf book to an iPad, iPhone, Laptop or Android. It is also readable on a Kindle. Additionally I tried it on a Blackberry playbook - but was unable to read it on that device. Richard Field packs exactly what you need to know to identify a species into just a few entertaining sentences. I can thoroughly recommend this book. I enjoyed the author's style of writing and his keenly observed remarks. At less than 6 Euro I'd urge anyone visiting Oman to buy this book. Richard Field's interest in marine life started when he worked for the Eastern Telegraph Company in Port Sudan in the 1960�s. He spent his leisure hours free diving and spear fishing. Inspired by Hans Hass's book Under the Red Sea, Richard bought a camera for �10 and designed and built an underwater camera housing using surplus telegraphic equipment. The author subsequently worked in Hong Kong and Saudi Arabia. In 1998, together with his wife Mary, he wrote his first book Reef Fishes of the Red Sea. He is a regular contributor of photographs to Fish Base and to ARKive. Thus wrote Robert Gibbings on observing soft corals for the first time on his visit to Hurghada. His words are as true today as when he wrote them in 1938. 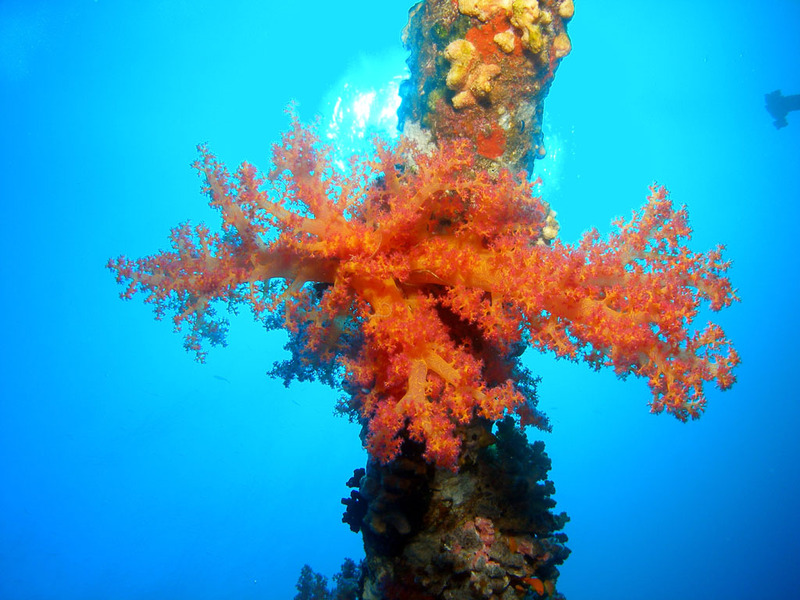 This gorgeous soft coral is Dendronephthya hemprichi, growing on the wreck of the Carnatic in the Red Sea. This species is a pioneer settler. It can clone small fragments of itself with root-like processes that quickly attach to artificial structures like wrecks. Especially vertical projecyions. Unusually, D. hemprichi doesn't depend on symbiotic algae: it is azooxanthellate (asymbiotic). Instead it feeds almost exclusively on phytoplankton. Eight feathery tentacles surround the coral's mouth and whip food into it. 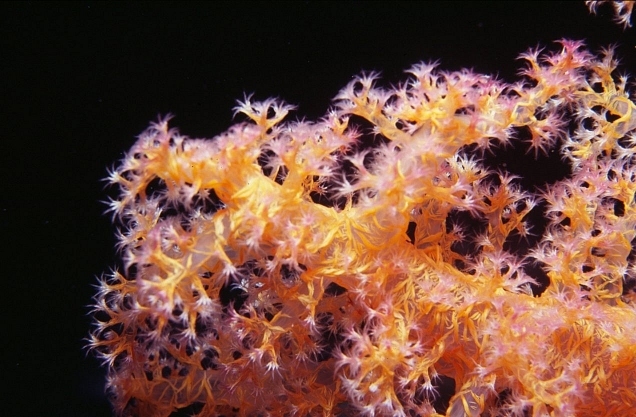 Relatively recent data on soft corals indicates that they feed on very small plankton such as single-celled algae, rather than larger particles as had previously been thought. 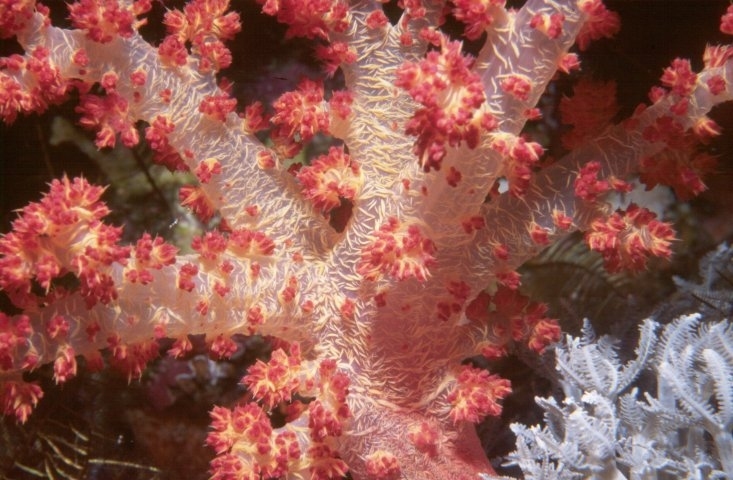 According to the Encyclopedia of Life, Dendronephthya are among the most commonly traded soft corals. Between 1988 and 2002 at least 12,618 were sold globally (the U.S. was the largest importer, with 51% of the total Dendronephthya trade). However, corals in this genus are poor choices for aquarium hobbyists. They generally die within a few weeks, mainly because they rely exclusively on filtering food from the water. You find Dendronephthya hemprichi in the Red Sea from around 11 to 32 m, standing out from walls and wrecks in currents. The government of Hong Kong is issuing a shark fin and bluefin tuna ban for their official dining. Techniques that can pick a terrorist out of a crowd are being adapted for underwater images, producing data on reefs in record time. The computer correctly identified corals versus other materials like rock, sand or algae between 92 and 95 percent of the time, the researchers said. Within corals, it correctly assigned the coral's genus -- the biological classification level above species -- 97 percent of the time. The grumpy-looking, gelatinous blobfish has won a public vote to become the official mascot of the Ugly Animal Preservation Society. As hard corals decline, gorgonians seem to proliferate - at least in the Caribbean. 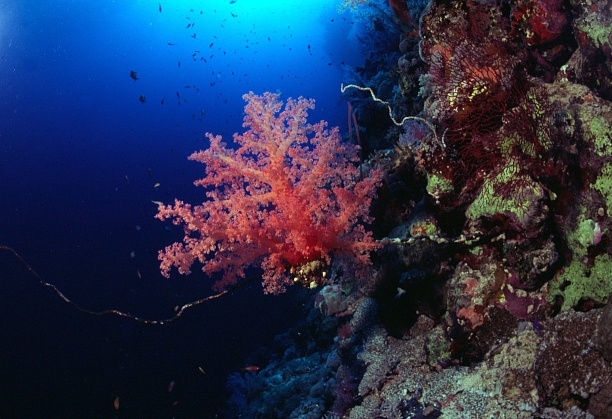 New study to investigate how gorgonian numbers have changed and why. As if tropical storms didn't get enough of a bad press, it now seems they can ramp up ocean acidification, putting the world's coral reefs under even greater pressure. Study shows that reef fish larvae can smell the presence of coral reefs from as far as several kilometers offshore, and use this odour to find home. Mysterious cephalopod's fragile arms lure its food close enough for killing. A new species of walking shark has been spotted hobbling along the ocean floor off the coast of Halmahera island in Indonesia. Last year in the UK, divers reported 314 diving incidents. The Royal National Lifeboat Institution's (RNLI) volunteer lifeboat crews have rescued 96 divers and saved 13 divers' lives in the past five years. The RNLI are currently conducting a survey of divers based in Britain. They want to hear from divers of all levels of experience, even those who haven't dived in the British Isles recently. The Philippines says it has spotted dozens of concrete blocks it believes may be the beginning of a Chinese construction project on a disputed group of reefs in the South China Sea. "Blue Halo" plan would create a vast reserve in ecologically rich waters which would safeguard significant parts of the Sargasso Sea, a 2 million-square-mile body of warm water in the Atlantic that is a major habitat and nursery for numerous marine species. A mystery in the ocean near Antarctica has been solved by researchers who have long puzzled over how deep and mid-depth ocean waters are mixed. They found that sea water mixes dramatically as it rushes over undersea mountains in Drake Passage - the channel between the southern tip of South America and the Antarctic continent. Mixing of water layers in the oceans is crucial in regulating the Earth's climate and ocean currents. The research provides insight for climate models which until now have lacked the detailed information on ocean mixing needed to provide accurate long-term climate projections. * Reprinting permitted with this footer included. We are happy for you to copy and distribute this newsletter, and use parts of it on your own web site, providing the above copyright notice is included and a link back to our web site is in place. Photo credits: Tim Nicholson, Down Below Marine and Wildlife Adventures, David Collins, NOAA and Richard Field .